Haim (pronounced "high-em") are a damned excellent band. Frontwoman Danielle has a ferocious snarl, guitarist Alana used to be California's coolest nanny, and bassist Este is a friendly giant who knows all of Britney's dance moves. You may have heard their singles Don't Save Me and Forever, which came out last year; and you may know that they won the BBC's Sound Of 2013 poll. 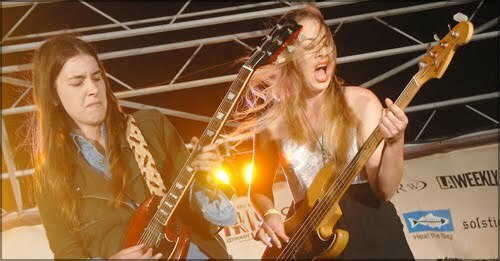 What you might not know is that when they play live, Haim engage in a brand of plank-spanking devil horns-ahoy "rawk" riffage that would make drippy indie bands like Fun. hide behind the sofa in a puddle of their own tears. 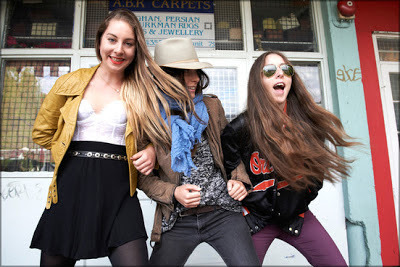 Let's illustrate the point with Haim's new single, Falling, which premiered on Radio One last night. First the single mix - restrained, catchy and funky. Then a live version, with a roaring guitar solo and some of the best drumming you'll see this year (courtesy of hired hand Dash Hutton). If you want to know more about the sisters' burgeoning success, take a look at the interview I did with them last December, as they supported Florence + The Machine at the O2. I've cut and pasted some of the off-cuts below. Read them now, before Tesco put them in a lasagne. A lot of new bands would be intimidated by the O2 but you seemed to attack it. Alana: I hope so. But, believe me, it's scary. The lights dim and you walk out on stage and you can hear your footsteps echoing and you turn around and you see all these people. And now we have in-ears instead of monitors, so everything sounds so silent. Does that mean you can't hear the audience at all? Your gran was here tonight, wasn't she? Este: Oh. My. God. Yes. Was that the first time she’d seen you? Este: Last night, last night was the first time. Alana: It's crazy for my grandma. She's never seen us play before so the first time was, like, the O2. Este: The whole family came. My dad's twin brother also came. This was a big moment for us and we wanted to share it. Because [sarcastically] obviously we hate our family. We're not about family at all. Pee-eww, we say. Poo poo to you, family. You used to play in a band with your mum and dad. Did you have to fight to keep them off the stage? Este: Before we got onstage for the soundcheck, my dad was up there playing drums. He was like, "ok they’re good, I checked them out for you". And we said, "come on dad, you just wanted to play drums in the O2 arena. Let’s be honest!" Alana: One day, when we headline a tour, wee'l bring the whole family up there. We'll make sure my cousins play some type of strings. There'll be a Haim bassoon. Of course a horn section. You all play drums in the live show. How does that influence your writing? Este: That's the most important thing for us, is the drums. It's really important to get that right and from there it's just kind of building. Danielle: A lot of time it starts with a drum beat that we'll make on Garage Band. Este, didn't you study Brazilian production? Este: I was a musicology major at UCLA and studied Brazilian carnival music, and a little bit of Bulgarian folk singing. You know, your run of the mill college experience. It wasn't like going to college, it was like going to camp every day. It was literally banging on drums every day. I don't think I could have gotten into UCLA if I wasn't doing music. It's a very small major, they only let in 15 people a year. It was a lot of fun. What do you do to relax on tour? Este: When we go back to the hotel, we've been watching a lot of Made In Chelsea. Alana: I'm obsessed with Come Dine With Me. It's the best show ever. Danielle: They just get wasted! Este: There's no shows like that in the States. Alana: I hope they don’t bring it to the States. I always hate it when they do that. Alana: Yes, Skins and The Inbetweeners. I was so angry. You guys have the best TV. Danielle: I love Dragon's Den. And for that reason, I'm out. That's so rock and roll! Este: We save the Rock and Roll for when we're onstage. When we get back to our rooms, we just watch America’s Funniest Home Videos and drink slurpies and snuggle in bed.